Home > Gerber Newsroom > Press Releases Gerber Announces Winner of Be Our Baby Photo Search 2014! 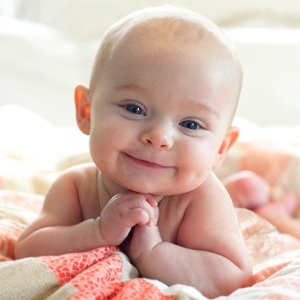 Gerber Announces Winner of Be Our Baby Photo Search 2014! FLORHAM PARK, NJ (Jan. 21, 2015) – Today, early childhood nutrition leader Gerber announced its newest, adorable star and winning entry in the 5th annual Gerber Be Our Baby Photo Search 2014 – featuring Grace from East Petersburg, Pennsylvania. The entry that featured the charming 7-month-old was selected as the Grand Prize winner from more than 180,000 entries. Grace’s parents will receive a $50,000 prize, one year of Gerber® baby food and the opportunity to appear in a future Gerber advertisement as the 2015 Spokesbaby. The Gerber “Be Our Baby” Photo Search 2014 was held online at Gerber.com/photosearch, where parents and guardians were invited to enter a photo of their child into the search during the entry period. A panel of judges reviewed the entries to find children from birth to preschool age whose photos displayed expressiveness and consistency with Gerber’s heritage. In the last five years of Photo Search, Gerber has celebrated six otherprecious babies, from a dimpled, smiling two-year old in 2010 to a pair of precocious and charming twins in 2013. Winning photos and information, along with additional information about Photo Search 2014 and Gerber, can be found by visiting Gerber.com/photosearch.